This truly is a rare example of the much sought-after Island Packet 485. “RHIANNON” is a very lightly used, one owner boat that has been sailed exclusively in New England Waters over the past 16 years. 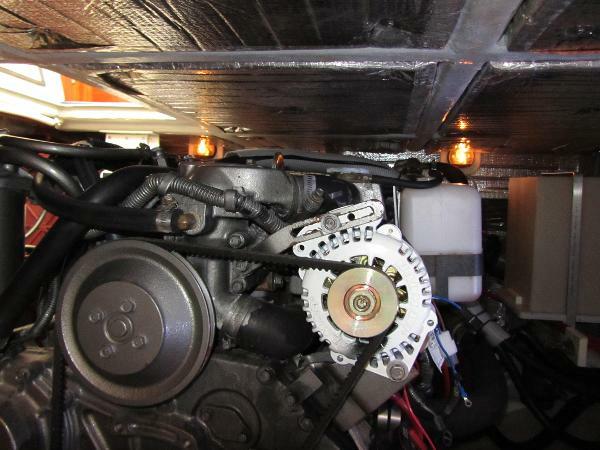 In fact, the engine has less than 650 hours! Nicely equipped and updated, “RHIANNON” sports a new electronics package (digital radar, autopilot, AIS, and two new MDF’s in cockpit and nav were all new in 2016), and a new (2015) Fischer Panda 8kW genset with just five hours! 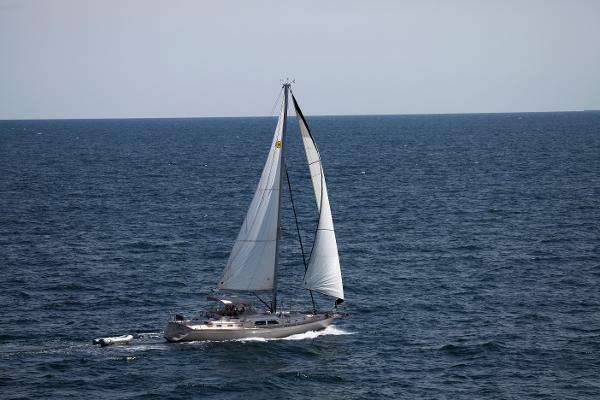 The owners are planning on new bottom paint and a new set of running rigging in April 2019, as soon as weather permits. More pictures as soon as weather allows. Like all IP485's, "RHIANNON" has a tremendous amount of living space and enough storage to hold just about everything needed for a circumnavigation. The thoughtfully laid out interior is bright, spacious and secure. Her functional deck plan, cutter rig, and cockpit configuration make her the perfect boat for shorthanded or single-handed sailing. Features such as a broad anchor platform and the spacious stern boarding platform, with dual boarding steps, help to enhance this yacht's appeal. The large aft deck is perfect for sunbathing: set up a folding table and you have an impromptu dining area, as well as enough space to accommodate a 10’ dinghy. The heavy work of placing the dingy on deck is done with the use of the “Extendo-Boom” option. With the push of a button, your dingy is out of the water and swung on deck. 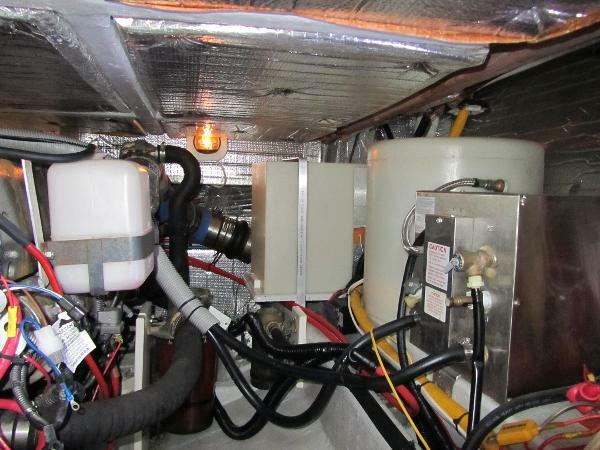 Storage bins on either side of the aft deck hold LPG bottles and miscellaneous gear. The side decks are uncluttered with raised bulwarks forward, and cabin top handrails provide for security on deck. Below decks, you’ll be immediately impressed by the panoramic view of the open main salon, which flows to a galley that can only be described as a chef's dream. Spacious forward and aft cabins with private heads, high-end wood joinery, a multi-use third cabin with an office desk, swing-out stool and bunk conversion option, plus a navigation center worthy of the Starship Enterprise are some of the many features that set this Island Packet 485 apart from the competition. "RHIANNON" is well equipped, mechanically well maintained, and ready to continue delivering cruising memories to a couple or family ready to expand their horizons. This yacht is equipped with all of the available factory exterior options including bow thruster, electric Harken winch package, Extendo-boom (for lifting a dingy out of the water and onto the aft deck), polished SS Dorade vents, and rubrail. The custom bimini and dodger have full enclosure panels and the cockpit cushions have open cell backrests for comfort at anchor. Custom SS handrails on the transom aid in boarding from a dinghy. All sail control lines run to the cockpit for ease of handling, with the knot, wind and depth instruments mounted above the companionway and the radar/ chart plotter mounted at the helm. When entering the bright airy Salon your first impression is how spacious this area is. The combination of the light colored cushions, plenty of natural light and the ability to stow the dinette table against the fwd bulkhead help to make the salon feel open and spacious. With the dinette table down and fully-extended you can comfortably entertain a large group. Two smaller "wine and cheese" tables sit on posts on either side of the saloon which can be easily removed when not needed. If extra bunks are needed to accommodate additional overnight guests, the port settee pulls out and converts to a double berth. The custom saloon cushions are covered with Ultra-Suede and the cabin soles are teak and holly veneer, providing a striking contrast. 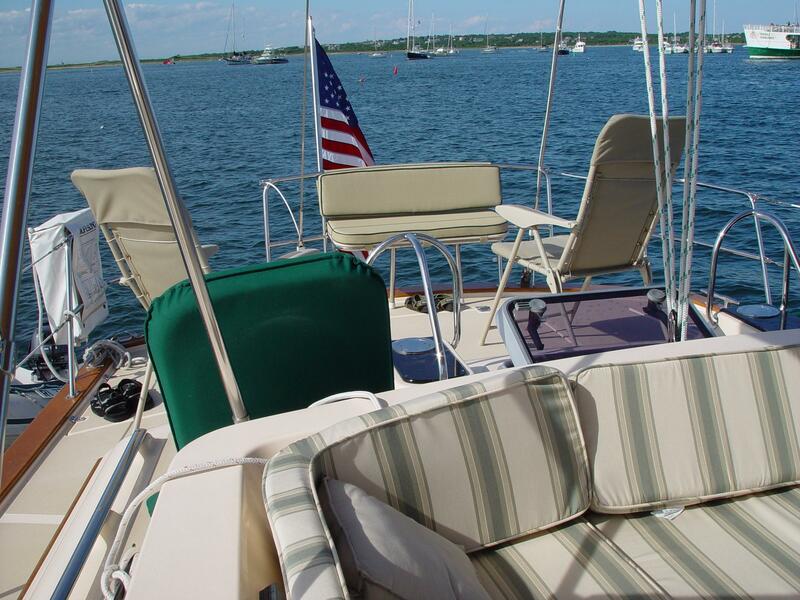 Peek-a-Boo shades are on all ports throughout yacht and custom curtains cover the larger windows. A central vacuum system reaches the entire boat for easy clean-up and a Bose speaker system provides entertainment. A total air conditioning package of three units provides 46,000BTU's of cooling or reverse-cycle heat to the yacht. The large Galley is located on the starboard side between the companionway and the aft cabin. Whether you are doing long distance cruising or entertaining at the docks, the galley does it all. The galley is equipped with two (2) refrigerator/freezers, each with separate compressors and controls, enabling the owner to make either box a refrigerator or freezer. There is also a separate pull-out refrigerated drink drawer with dedicated controls. The three-burner Force 10 LPG stove w/oven and broiler has sealed burners for easy cleaning, as well as a retracting door to prevent tipping when gimballed. On the inboard island is plenty of open counter space. To finish this area there is a deep double bowl sink, fresh water hand pump, microwave oven and a storage cabinet for additional items. The Corian countertops are beautifully finished with a one-piece integrated fiddle to aid in cleaning and keeping a neat and orderly galley when underway. The cabin sole is made of a molded nonskid for easy maintenance and a sure-footed feel. Moving aft you enter the Owner's Stateroom. The focal point of this cabin is a queen-sized island berth with a HMI SS Spring marine mattress. Again this is a very bright and airy cabin with lots of headroom. There are (6) opening ports and a large overhead hatch to provide both natural ventilation and light. On the starboard side is a built-in chair flanked by large cedar-lined hanging lockers and shelved storage. There is a large pull-out drawer beneath the berth and the bottom of the berth opens up, with the assistance of gas struts, to provide access a large blanket storage area. Access to the large aft deck locker is also provided through a gasketed door on the aft bulkhead. The Owner's Head is located on the port side. It features a VacuFlush toilet, molded shower stall, with a seat and folding acrylic door, a vanity with a one-piece molded countertop, shelves, a mirror and plenty of ventilation. The comfortable Forward Stateroom offers a double island berth, lockers, shelves to port and starboard, excellent ventilation and direct access to the Guest Head. The base of the berth lifts up for storage and there are two pull-out drawers. Excellent ventilation and natural light make the forward stateroom a comfortable space to spend time. The Guest Head is accessible from both the forward stateroom and the Saloon. The countertop is a one-piece acrylic with molded-in fiddles and a stainless steel sink. The head has a freshwater VacuFlush unit with a dedicated water tank. The large shower stall has a bi-fold acrylic door and a teak seat. The Third Cabin is the most functional space on the boat. It has a large countertop and plenty of cabinets and drawers for spares and supplies. There is even space for a washer/dryer combo here. A factory-supplied conversion kit allows this area to be made into a third double bunk when needed. Safety gear, including Life Sling, life jackets, bell, etc. The 485 provides enormous living space, enough storage to hold gear for a circumnavigation, enough sail to speed you comfortably to your destination and the convenience of managing it all from the cockpit. From the broad anchor platform to the spacious stern boarding area, the 485’s deck abounds with features you will appreciate. I am Interested in more information about the 52 ft Island Packet 485 2003 I found on your website. 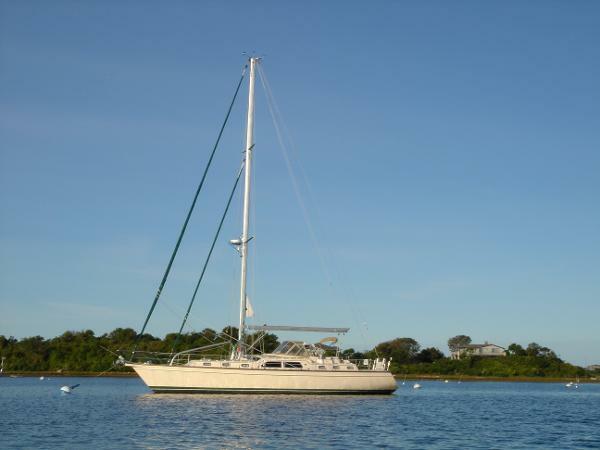 I am Interested scheduling a showing of the 52 ft Island Packet 485 2003 I found on your website.